Please don’t get the wrong idea from this quote, I’m not having a rough or bad day. To be honest, I’m having a quite wonderful day considering it’s only 10am. I just think this is a wonderful reminder. I actually like to remind myself of quotes like this when I’m have good days to keep myself grounded; To remind myself that the good come with the bad. It’s funny how one day can seem impossible to get through and then the next is so good you don’t want it to end. I suppose we need a good mix to remind us to be grateful for all we have. While I have this platform I’d like to request some energy, thoughts and support for so many important people in my life right now that are going through their fair share of struggles and pain. I hate when perspective comes from the darkest of circumstances but I guess that’s what I meant above…it’s the bad that gives us perspective of the good. Today….be grateful! EVERY DAY…be grateful! 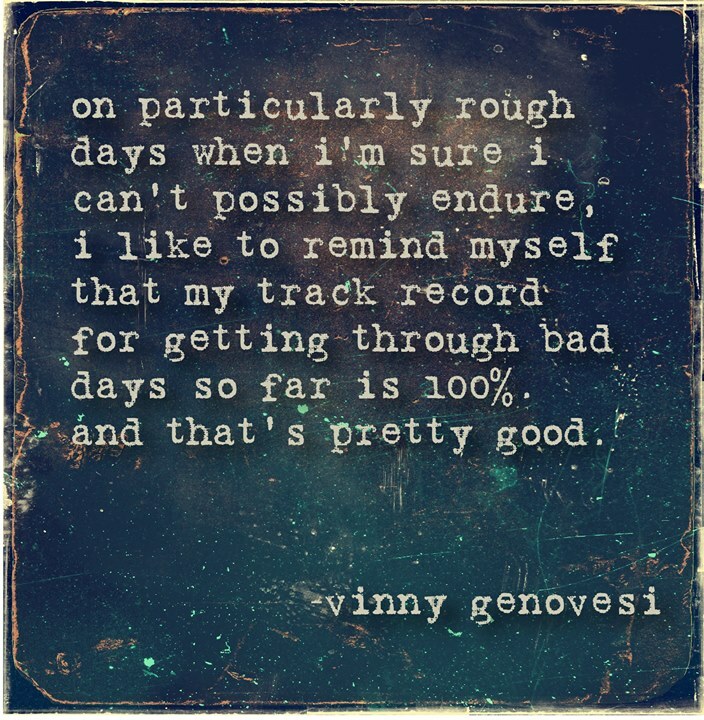 Vinny Genovesi deserves credit for this quote. This image was stolen and the author cropped out.